Managing a digitisation project, especially a large-scale one, can be daunting. But thorough planning beforehand can go a long way to avoiding potential problems, achieving the best quality outputs, and ensuring the project is a success. Having worked with over 400 archivists, record managers, and curators, on all manner of digitisation projects, we have a wealth of experience in helping our clients plan and implement them effectively. Though it may sound painfully obvious, clearly defining the purpose of the digitisation project and what you aim to achieve from the outset is critical. These aims will guide virtually all other planning decisions for the project; from which specific materials you choose to digitise and designing your digitisation workflows, through to how you offer access. For example, it may be that you want to support conservation efforts by creating a digital version of a collection for internal staff to use, to minimise the need to handle the fragile analogue materials. Alternatively, you may want to publish the resource online via a digital archive website to offer public access, or to simply create a high resolution back up of the original materials for preservation purposes. Who are you digitising for? Considering the intended users of your digital resource and how they will be likely to utilise it, will enable you to make informed decisions about which descriptive metadata you will capture, how you will provide access to the archive, and more. It is essential to perform a condition assessment of the materials you intend to digitise during the planning stage of the project, to ascertain whether they are in a suitable state to go through the digitisation process without being harmed. In many cases, if the items you are planning to digitise are being regularly handled, they are likely to be suitable (as long as the technicians carrying out the scanning adhere to fragile handling guidelines). However, in some cases conservation processes might need to be undertaken to stabilise or repair items before digitisation can proceed. Do you have the necessary human resources, skills, and equipment available to perform the digitisation? And more specifically, do you have the resources to complete it to a sufficient quality, within the project timescale, and without harming the precious materials? The answers to these questions will impact whether you decide to digitise in-house or outsource the scanning to an external digitisation specialist (see point 5.). Whether you digitise in-house or outsource to an external organisation will be strongly influenced by your available budget and existing capabilities for digitisation. It’s important to carry out a thorough cost-benefit analysis to establish which option will provide the best holistic value for your project; in terms of quality of image output and project turnaround time, as well as minimum risk and financial cost. Digitising in-house does offer more control over the project and might intuitively seem the cheapest (and therefore best) option. And indeed it can be, if your organisation already possesses scanning equipment, trained and experienced staff, and your materials are not of a particularly fragile nature. But if not, digitising in-house can incur significant overhead costs, such as equipment and staff training. Extra potential time costs associated with staff training, staff learning curves initially reducing productivity, management time spent performing quality checks to ensure consistency, and more. Potentially increased risk of damage to the materials is another factor to consider if your staff are inexperienced in digitising fragile items. Conversely, outsourcing to an external supplier is often perceived as expensive. However if an experienced premium provider is chosen, the quality and consistency of the digital images, throughput rate, and turnaround time of the scanning, can be superior due to economies of experience and specialised equipment. In addition all of the overhead costs of the digitisation (power, workspace, equipment, media, staff time) are absorbed by the supplier when outsourcing, making your costs more transparent. Firstly, by capturing metadata that will be valuable and useful to your target users. This metadata can be associated with the digital images and made fully searchable, allowing fast information retrieval and viewing of the digitised records for your users. Secondly, by making the digital archive available via a medium suitable for your target users. For example, if you are creating the digital archive for staff use within your organisation, this could be as simple as importing the images and metadata into your existing digital asset management system. But if you are looking to offer access to the public and allow them to look up records (such as with an archive of burial registers), this could involve importing the images into a web content management system and making them available via a dedicated archive website with search functionality. Obviously these two options will have vastly different implications for both your budget and project timescales. Does your organisation own all of the archive items that you are planning to digitise? If not, you may need to gain permission from the owner(s) of the materials before you can legally digitise them, and you will need additional permission if you plan on making the digital files available to the public online. If you are outsourcing the digitisation, it’s also important to ensure that you will own the copyright to the digitised images once they are created, and that the external supplier does not retain ownership of them. In addition, if you intend to publish your digitised content online, you may need to plan how you will protect your own copyright; such as digitally watermarking images when displayed on the web. For further information The National Archives offers this guidance on copyright for archives. To maximise the long-term usefulness and accessibility of your digitised images, it is recommended to capture the master images in an open source, non-proprietary format. Examples of these include TIFF, JPEG, JPEG2000, and PNG. JISC Digital Media recommends capturing initially in uncompressed RGB Baseline TIFF format to create master versions of your images, and this is the standard format that TownsWeb Archiving captures to for our clients projects. All surrogates (such as compressed JPEGs for the web) can then be produced from these masters. If digitising in-house, running a small scale pilot digitisation project can help test and refine your digitisation workflows, as well as provide benchmarks for throughput rate, image output quality, and staff time. These benchmarks will enable you to more accurately forecast timescales and staff overheads for budgeting purposes. If outsourcing the digitisation, most professional suppliers (TownsWeb Archiving of course included) will take samples of your collection to perform test scans. These will then be used to provide sample images to show the quality of the outputs, give an accurate estimate of timescales and costs. We recommend storing your digital archives in a minimum of two geographically separate locations. Ordinarily this will involve holding one copy on your organisations server or local PC’s, in addition to a copy stored on an external hard drive elsewhere. In the longer term you will need to consider digital preservation and the potential for medium/file format obsolescence. Digital preservation is an important topic with a fast growing body of literature, far too much to cover here. However, as a starting point The National Archives offers these Three Golden Rules of digital preservation. In terms of management, it is likely that you will have an existing system that is used to organise your digital archives. However, if not there are a number of different digital archive management platforms, including TownsWeb Archiving’s own PastView system, that can make it quick and easy to maintain your content. Once again though, a cost-benefit analysis of these systems will need to be carried out to ascertain if they are suitable for your project’s budget and needs. Would you like more digitisation planning advice? We hope you found the above guide helpful. 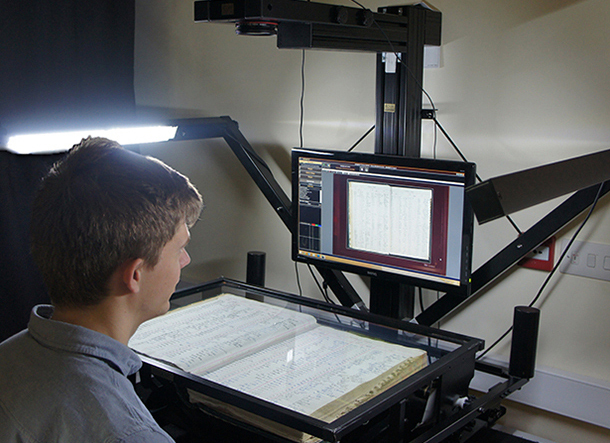 If you are considering a digitisation project and have questions that aren’t answered here, please contact us by phone on 01536 713834 or email and one of our digitisation consultants will be happy to have a chat. You might also find our Best Practice tips for using Volunteers in Digitisation Projects interesting.